Our guides will take you on a fun day tour, where you get to try out electric bikes as a new way to get to the hiking trail. We will start at Hotel Aak and find equipment that fits you, before we roll away towards today’s adventure. 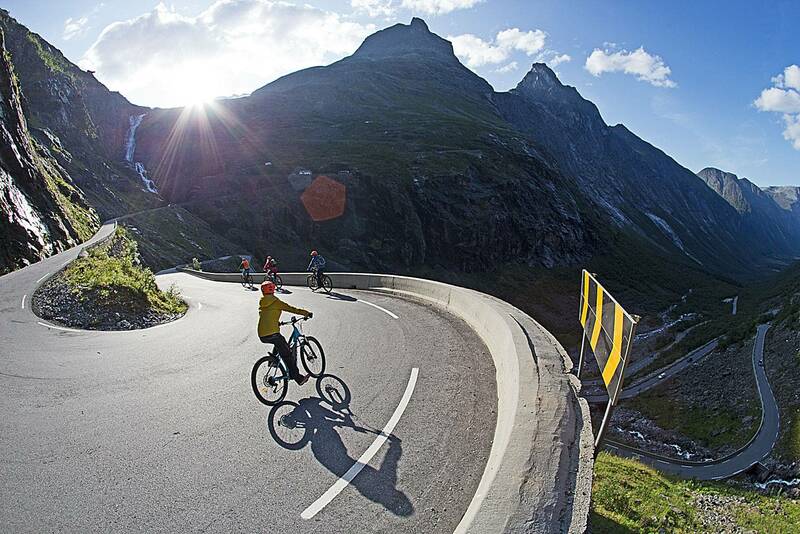 We will bike up the famous Trollstigen Road and choose a hike up on the mountain by Trollstigen Platau. NB! Remember that we will be outside for a whole day and can have some weather and wind in the mountains. Bring clothes (warm, wind and waterproof) for the weather conditions in Norway. ..you would like to try something new and exciting! ..you want to do both electric biking and hiking, but you only have one day to spend in Romsdalen! The tour is recommended for everyone who can ride a normal bike and who can hike a mountain trail. Meeting point at Hotel Aak by the reception at 10.00 AM. We will find equipment and bikes that fits everyone. When we are ready, we will test the bikes a little before we roll away to our adventure. The tour takes about 5-7 hours. We return to the hotel and check out the equipment before the tour ends. After Bike/Hike for those who want in the bar at Hotel Aak. Guide that makes sure you have a safe and fun tour. Two activities in one tour. Helmet, gloves and jacket is included. Close to and in to stunning nature environments. Environmental friendly transportation + hiking!